When I began my journey this year into the foreign domain of learning how to love myself, I had no idea what would happen. I had certain goals in mind for the year. When I looked at my long list of resolutions, I kept asking myself how I was going to accomplish all of this. I mean, what exactly does it mean to love yourself? Loving yourself is about stopping yourself from causing yourself anymore sorrow. It is about taking a deep internal look into your dreams, your desires, your wants and aspirations, and deciding that you will stop making excuses and take the chance of living the life you daydream about every single waking second. Loving yourself means believing you are worthy enough to be a greater version of yourself. It is so much easier to notice when we cause sorrow to others. When we realize we hurt someone, we feel remorse and quickly try to fix things, or at least try to say that we are sorry. But what about the sorrow we cause ourselves every single day? How many lies and empty promises do we tell ourselves every single day? Tomorrow, we will go on a diet. In the morning, we will get up early to write our novel. We will head to the gym, first thing tomorrow morning. The future is our excuse, because we have this insane belief that we have an unlimited amount of time on this Earth. We will do everything in the future and never right now. Yet, when tomorrow becomes today, we are back to telling ourselves the same thing, “Tomorrow, I will…”. I mean, seriously. Who are we kidding? Putting off everything keeps us in a constant state of sorrow. The reason why we make empty promises is because when we say we are going to change, we are coming from a place of unhappiness. The changes we promise ourselves are not because we love ourselves. We make them because we don’t like how we look, or how much money we make, or the state of our health, or the life we are living. We are demanding that we change from a place of hate, that part of us where we hate ourselves. And that is why we fail in our resolutions. So instead of saying to ourselves that we need to change so we can stop hating ourselves, let’s focus on changing ourselves because we would love to be that person we daydream about being. Truthfully, in our heads we know that our life would be complete sorrow unless we are that person we dream about being. So what if we stopped dreaming and just became that person? If we changed the narrative to doing this because we love ourselves enough to change our lives for the better, the results will be so much more different. You will actually stick to your resolutions. Your decisions will be based purely on if it will make you happy, because you know you are doing this out of love for yourself. This year, when I began my journey, I set very high, unrealistic goals. I pushed myself out of my comfort zone and told myself that I am doing this for me, because I do not want to cause myself anymore sorrow. No more hurting myself. I realized that not working on the book, being creative or doing the things I love to do caused me sorrow. Every single day, I chastise myself if I do nothing for this site. I wanted to stop doing that to myself, being that person I hate…the procrastinator that gets nothing done. Realizing just how much sorrow I brought to myself, I decided to stop being that procrastinator. Why in the world was I choosing to hurt myself by not doing something I really wanted to do? I should just do it! I made out a list of all of the things I wanted to do for myself. Then I focused on loving myself. If I loved myself, what would it look like? What kind of life would I have? Who would I be? I decided to lose 75 pounds this year…technically, 85 pounds, because when I made the bet, I already lost 10 pounds at weigh-in. I bet $50/month ($600/yr) that I would lose this weight by year end. If I lose the weight, I am set to gain over $2400. I made the bet through an app called Healthy Wage and got my brother to make a bet, too. Everyone I encounter on a daily basis knew about my bet. I have one person checking in on my meals. Another person checks to make sure I exercised. I made the decision to lose the weight, because frankly it was time and I was tired of making excuses. I found a way to lose the weight and that was going on a paleo, low carb, no sugar diet. But it is not just a diet. It is a lifestyle. If I don’t want another tumor, I need to focus on my lifestyle. I need to love myself enough to take care of my health, so that I will not be put through another cancer scare. When I workout, I do positive affirmations. I repeat, “I am losing weight,” over and over again. Oddly enough, mixed with all of those happy endorphins I am generating, I notice that the weight comes off more frequently when I do this. Those positive affirmations tie into my goals and loving myself. Losing this weight is about seeing the person I dream of being and becoming that person. I have to love myself enough to be the person I dream of being. Guess what? It takes a lot of work to become the person you dream of being, because we live in an auto-pilot world, sinking into the doldrums of existence. We have to work hard to stay out of that thinking in order to create our new reality. We become so accustomed to doing the same thing every single day, that we have a difficult time stepping out of our daily routine. That routine is not who we are, especially if it is bringing us so much sorrow. We are living a life that does not reflect who we want to be. You see, losing the weight is only part of my goals this year. It ties into all of the other stuff. The plan includes morning and evening meditations, morning runs, working on the novel, and working on the site (even if there isn’t a daily post). I even have a goal to make half a million dollars outside of my day job. This is a goal I’ve told everyone about, including my bosses. One boss understands why I am doing it and completely supports my endeavors, because that plan includes him, too. I made sure my goals all tied in together, because the change I seek within myself is to be the person I dream of being. That requires a lot of change and a lot of hard work. To live on auto-pilot is to create sorrow within myself. I love myself enough to stop creating anymore sorrow to myself. By not becoming the person I know I am supposed to be, I create sorrow to myself. That needs to stop. When I started this journey, I planned on focusing only on me. My friends and family all knew what I was doing, so that they could all help keep me on track. I made sure that I kept up with the positive affirmations, journaling, and doing things that focused on keeping my mindset on loving myself, and creating no sorrow to anyone, especially to myself. Relationships or finding love was not on my radar. It was not even on the agenda. But something strange happened at the very beginning. For some time, my heart had been putting out there that what I desired the most was someone who could inspire and challenge me to be better than I am. When you find that person, you don’t let them go. So there he was, staring me right in the face, letting his heart do the talking. I looked at him and realized he was in love with me. Then I saw how the universe had been at work for some time. I had to ask myself how I felt about all of this. I looked at him and realized I felt the exact same way and I was not about to let him go. It’s funny how all of this works. Learning to love myself is something I work at every single day. I try my hardest not to fall back into routine, because that is where I am the unhappiest. In return, the universe keeps offering up new opportunities that coincide with my goals. You see, when you put love out into the universe, it comes right back to you. Every single goal you are trying to achieve, the universe lends a hand, because it wants you to succeed. We all know who that person is that we want to be. It takes loving yourself enough to go out there and become that person. You already know what your daydream is. Write it down. Every single dream you have for yourself, write it down in a journal. Look at all of the entries you’ve made. What can you accomplish in one year? Create a life plan by breaking down each goal. Want to buy a house? What steps do you need to take to buy a house? Break it all down and then start taking steps towards making that goal a reality. For example, for this year, I took my goals of weight loss, healthy lifestyle, financial goals, and my career, and started mapping out what I could do in the first year, one step at a time. Make it part of your day. Schedule the changes into your life. For example, I am up at 4:45AM every morning. The cats are in on it. If I try to sleep in, one of them comes in to wake me up. I get up, feed them, then meditate until 5:30AM. At 5:30AM, I go for a run or do some sort of exercise. 6AM, I’m ready to write my novel. 7AM, I start getting ready for work. On the commute, I work on social media posts and business items for the site. After work, I focus on more business items for the site, go to events, maybe even write a post. All in all, I am kicking out several goals all in the same day. At the end of the day, I make sure to journal the positives for the day and write a couple of love notes. I finish the day off with a deep meditation with God. I start and end my day with God, because through God, all things are possible. Positive Affirmations. I hate to exercise. I really do. So when I exercise, I make sure to say positive affirmations as I workout. 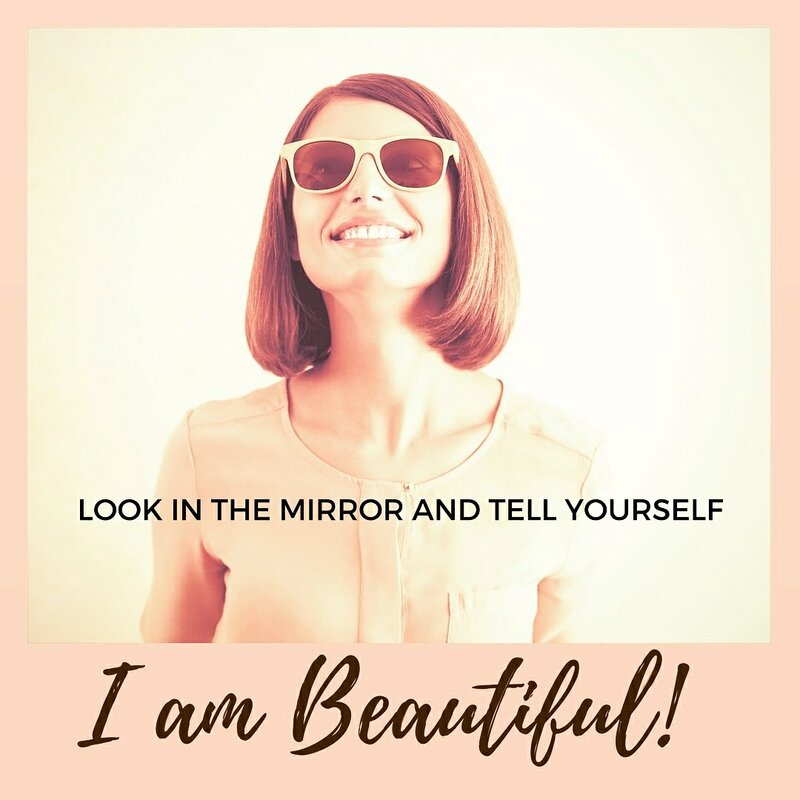 I find that doing positive affirmations really lifts your spirits and gets you on a ‘love yourself’ high. I’ve also changed my narrative on my least favorite activity in the world…running. I tell myself I am a runner. That’s what keeps me running. So tell yourself you are fit, beautiful, healthy, and everything you want to be. Claim those titles as your own, because you need to see yourself as that person. That means you need to brainwash yourself into believing you are that incredible person you daydream of being. Hustle. Don’t ever go back to routine. Always keep charging ahead and hustle the hell out of life. It’s more fun that way. Self-check. Always be conscious of not causing yourself anymore sorrow. The moment you notice you have a bad feeling, take a step back and ask yourself why you are feeling that way. What can you do to take that bad feeling away? Do you get mad every single time you think about someone or an incident? Ask yourself what you can do to stop feeling that way. What solutions can you present to make yourself feel better? Always self-check your negative emotions, get to the root of why you feel that way and fix it. We have a choice in how we choose to feel. Keep at it. Life is all about making ourselves better than we are. We always have room to learn and to grow. Never stop becoming the best version of yourself. Keep working at it. Be Open to Love & Opportunities. Sometimes what we put out there comes right back to us. We have to be willing to let those opportunities in, especially when they are good for us. Loving yourself also means letting people love you. The greater the love you have for yourself, the greater the love you will have coming right back to you. That is the kind of investment you want to make. As the new year begins, I reflect upon the person I am and the person I want to become. Am I living my best life? How can I do things better? Before the ball dropped in Times Square, I set to finishing one last book for the year. 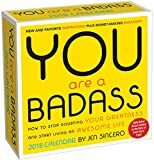 I chose to read “You are a Badass: How to Stop Doubting Your Greatness and Start Living an Awesome Life,” by Jen Sincero. I wanted to go into 2018 kicking and screaming: THIS IS MY YEAR! 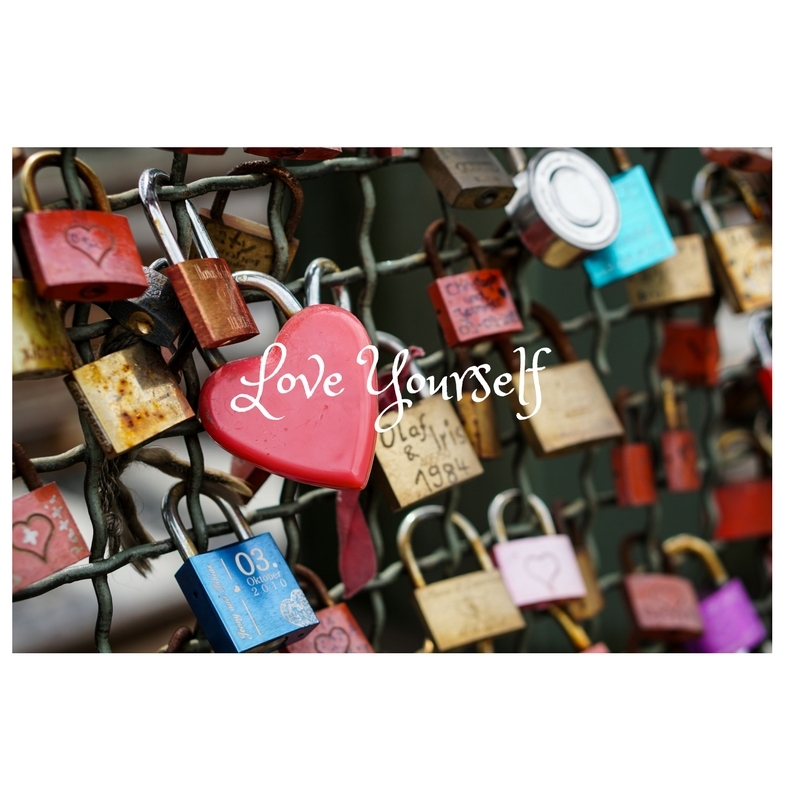 One common theme throughout the book, at the end of every chapter, Sincero tells us, “Love Yourself.” If you want to live the best life, you have to learn to love yourself enough to go out and make the things you dream of doing happen. 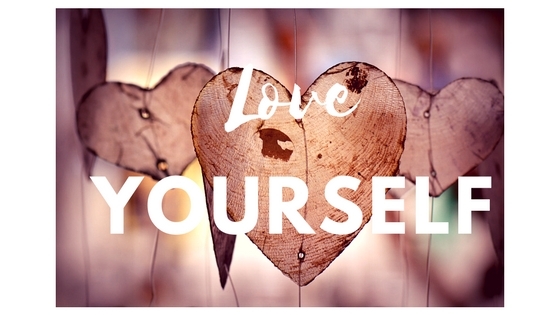 You have to love yourself enough to get healthy, lose weight, earn more money, work hard for your dreams, and do the scary things that will help you accomplish your goals. There must be enough love in there for yourself to be the person you dream of being. We can make the usual resolutions, but we will not accomplish those goals unless we love ourselves enough to see it through. I made a bet with my brother that we could lose 75 pounds by the end of 2018. He was a little reluctant to make the bet (he still is), but I went ahead and made the bet legit through the Healthy Wage app. If I lose the 75 pounds by the end of the year, I stand to win $2,500 through the app. That’s a nice little vacation or a new wardrobe (or both) after I reach my goal. In other words, I would be getting paid to lose weight. That is what that means. Losing a lot of weight like that is not easy, especially when I know how difficult it has been for the last 20 years to drop the PTSD weight. Or rather, was that just an excuse? Last year, for the first time, I learned that maybe there was a way to lose the weight. I attempted the Whole 30 diet two times. After the first month, I dropped 10 pounds. I learned the science behind what food was doing to my body. All of those chemicals we put into our bodies are making us sick. Our bodies do not know how to process the ingredients, so it gets buried away in our fat cells. Carbs + stress = cancer. Reading how carbs and stress cause tumors in our bodies was a huge wake up call for me. My last tumor was in a hormonal gland. To think it was carbs that caused it…wouldn’t you want to change your diet? I did. It was a harsh realization that what I was putting into my body was making me sick and stagnating the weight loss. Hence, it was not how much I was eating. I am not a big fan of sugar. When I have my sugar cravings, I eat a little sugar and that’s it. I prefer salty and sour. One thing that surprised me on the Whole 30 diet was just how much sugar is in everything we eat. It’s in everything! Sugar loves fat cells. It sticks to those babies and doesn’t let go. Whole 30 takes sugar out of your diet (you can get your sugar from fruit), and forces your body to get the sugar from your fat stores. Instead of feeding your body sugar when it signals for it (through cravings), you are forcing your body to use what it has been socking away for a rainy day. Yes, there is a process of detox through this month away from bad foods, but during that time you start to learn…OMG, I can lose weight if I change the way I eat. You are what you eat is a truer statement than you will ever realize. It is more about what you put into your body, not how much you workout, that will determine how healthy you are. For the foods you love, you can find new ways to eat. I am a huge fan of vegetable noodles. 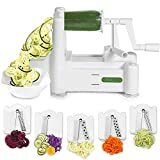 Last year, I upgraded to a bigger spiralizer to crank out zucchini noodles faster. 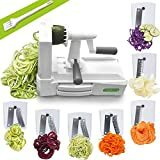 I can’t tell you how much the spiralizer has helped me to see vegetables differently. 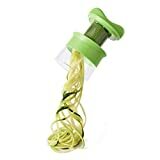 As a result of this great invention, I changed the way I eat noodles. I mean…I LOVE NOODLES!!! To switch my beloved spaghetti or rice noodles with zucchini noodles was terrifying [aka what am I going to eat now? ]…until I tried it and did an OMG! It was so much better than the regular noodles. Switching from rice to cauliflower rice was also a positive switch. I could not tell the difference. These little changes in how I eat my favorite foods not only helped me to lose 10 pounds for the first time in 20 years, but it also made me feel better. It was losing those 10 pounds that I realized that I could lose weight. I just had to change the way I did things. While there is a body positive movement going on, I applaud everyone that says they love every single thing about themselves. It takes a lot of strength to stand up and say you love yourself just the way you are. Not all of us are that way though. We battle our own internal demons. Over a decade ago, I was used to being in front of the camera. Then one day, I got behind the camera and didn’t think twice about getting back in front of the camera again. Like most people, there are parts of my body I never want anyone to see. I hate my mother’s legs, so guess what I got? Genetics. As time goes on and our bodies age, we start to think back to when we actually loved our bodies. For me, like many others, it was in my teenage years. I am at the weight I am now because of PTSD. I was sexually assaulted and harassed my freshman year in college. I thought, if I had been fat and ugly, this never would have happened to me. So my body responded with its self defense mechanism and the weight came on and refused to come off. As I got older, I discovered that it did not matter what I looked like. Sexual assault does not discriminate. It can and does happen to people, no matter what they look like on the outside. Sometimes the demons of our past can haunt us for the rest of our lives. We blame ourselves. We belittle ourselves. The horrible things the people we loved said to us echoes in the back of our mind. We perpetuate the hurtful truths onto ourselves and put it on repeat until we believe we are that horrible person. The person we really need to stop from making us into a victim over and over again is ourselves. I am honestly tired of telling myself how unhappy I am with letting myself become this way. It’s not just weight. I am talking about the life I live, the decisions I make, the constant fear of success (so I sabotage myself). The reason why I am this way is because of unhappiness, fear and not loving myself enough to know better. The feelings of not being good enough to succeed are angry words I tell myself all of the time. I am ready to turn off that sad song playing in my head. Rather than victimize ourselves over and over again, each and every single day, we need to change our tune. I made several resolutions this year regarding reading, losing weight, going on vacation (with Matthew Lucifer), finances, and making my dreams come true. The success of those resolutions go back to one central theme. I have to love myself enough to go out there and make those changes so that I can be happy with my life and who I am. I am done with being too afraid to take the next step to be the person I dream of being, because I hear in the back of my head, “You will never amount to much.” Instead, I choose to love myself enough to believe that I deserve the best life possible. I choose to make my dreams come true by loving myself enough to go after each and every single one of them. All it takes is believing in myself enough to take that first step. This year, I will be sharing my journey. On Instagram, you’ll find the daily meals, including the books I’m reading. On the blog, I’ll be sharing recipes, tips and the journey. I encourage all of you to join me in this journey. Take some time and sit down to figure out what it is you want out of life. What will make you happy? Read “You Are a Badass” by Jen Sincero. It will help you really take a look at your life and help you develop a plan to live your best life. After you come up with a plan, how are you going to accomplish it? Sometimes it takes a village. So let’s do this together. Let’s encourage each other, give helpful suggestions and do what it takes to make every single dream come true, because you love yourself enough to live the life you dream of.